Annual Rebuilding Day, held each year in April, is our signature program. It is the end result of a year’s worth of planning, organizing, and equipping dozens of volunteer service projects. 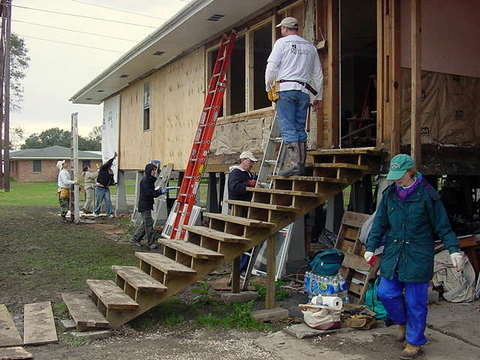 Since our work began in 1998, over 600 homes in the Acadiana region have been repaired through this program. Rebuilding Together Acadiana is part of the Rebuilding Together national network of over 200 affiliates. On Annual Rebuilding Day, RTA is part of a national movement as Rebuilding Together affiliates across the United States carry out projects to revitalize communities and improve the quality of life for homeowners across the country. Our next scheduled Rebuilding Day will be April 2017. Homeowner applications for this event are due by November 1st. If you would like to apply for this program, click here for more information. If you would like to volunteer for Rebuilding Day as either as a team (get your work, religious institution, athletic team, friends, and more!) or as an individual, please e-mail Jodee Ware at RebuildingTogether@hotmail.com for more information.